4th Clarion MAP680 | What Car? It's the super-quick menus and maps that put the Clarion in fourth place. The Maps are simple in design, making them easier to follow because of it. The system also zooms in on the action when any change of direction is required and the spoken instructions are clear and timely. The menu layout isn't quite and clear as TomTom's or Garmin's, but it's still better than most. Punching in a destination is quick and easy, although the cradle is bulky. 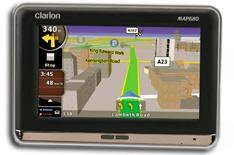 We couldn't find many shops selling the MAP680, but Caraudiogiant.co.uk has slashed the price by 45, bringing it down to under 180. For that amount of money, we reckon European maps should be standard. Plastic case doesn't exude quality, but the 4.3in screen is super-bright and still visible in bright sunshine. The cradle isn't the sturdiest, though, despite its hefty size. If you need navigation for Europe then look elsewhere. The Clarion does include TMC, an MP3 player, Bluetooth and the option of picking the most economical route to your destination, though.